Renowned oceanographer Dr. Sylvia Earle gives this defense of ocean exploration. The space community should also pay attention. Dr. Earle is the former chief scientist at the National Oceanic and Atmospheric Administration and currently explorer in residence at the National Geographic Society. She has led more than 60 research expeditions and spent over 7,000 hours underwater. 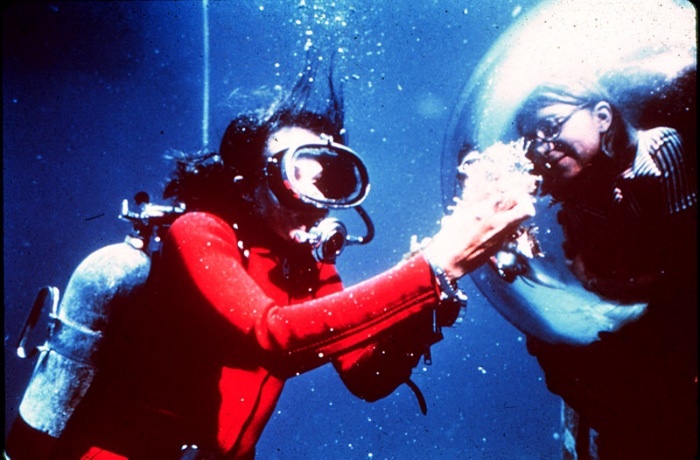 Dr. Earle has set women’s depth records in a hard-shell diving suit (1,250 feet) and a submersible (3,300 feet), as well as leading a team of female researchers during an extended underwater stay in the Tektite II habitat in 1970. No one denies that Sylvia Earle is an explorer. Yet, there are people in the space community who insist that astronauts (especially citizen astronauts) are not explorers. Ben McGee discussed this in his recent treatise. “Particularly amongst the old guard of space science,” McGee says, “‘exploration’ is reserved for those pushing the frontier in higher orbits, cislunar space, trips to near-Earth asteroids, Mars, and beyond.” In other words, almost no one. Near-Earth spaceflight in general, and suborbital spaceflight in particular, have been derided as mere tourism, joyrides, “going around it circles” — anything but exploration. Rhian would have us believe exploration is finished the minute a human first sets foot in a new territory. In reality, it’s just started. The volume of suborbital space is greater than the total volume of the world’s oceans. It is folly to think the potential for exploration has been “used up.” In just the last few years, scientists have discovered a number of unsuspected phenomena taking place in the suborbital region: blue jets, starters, ELVES, sprites, antimatter emissions, and dark lightning. It would be hubris to assume that there is is nothing else left to discover. Additionally, human spaceflights have taken place from only a few launch sites — notably central Florida and Kazakhstan. The suborbital regions above other parts of the Earth, including the North polar region and the entire Southern hemisphere, remain completely unexplored by human beings. Even unmanned launches into those regions are rare. Limiting space exploration to a few rare trips beyond Low Earth Orbit would be like limiting ocean exploration to the bottom of the Mariana Trench. (Although, Rhian might argue that even visiting the Mariana Trench is not true exploration, since that has been done, twice, over a period of 52 years.) It’s useful to note that the people who want to limit space exploration in this manner are generally not explorers themselves. We very rarely hear a real astronaut make such arguments. If we applied Rhian’s model of exploration, our knowledge and use of the oceans would be limited indeed. As limited as our use of space. Written by Astro1 on August 20th, 2013 , Citizen Exploration Tags: Why humans? Yes, “traveling down the same road for more than half a century” can be considered exploration. Lewis and Clark traveled the same paths which Indians had traveled for centuries (and white men for many years), yet they are considered explorers. The dictionary says that exploration is “travel for purposes of discovery.” It does not put a time limit on it. If you visit a bookstore, you will find numerous titles such as “Exploring New York City.” The title is not to imply that no one has ever explored New York City before, nor are the authors charged with false advertising. If that’s not good enough, you might want to visit the Explorers Club website and look at the definition they give. The rest of your comment is offensive and has been deleted. I would argue that exploration is a frame of mind more than a specific activity in particular surroundings. Children, for example, are professional explorers, investigating a world that seems familiar to jaded adults, but finding new things in it. However, there is a difference between the ocean and space as venues of human activity. The ocean is not a frontier by the definition I understand. It has no potential to be sufficiently isolated, either environmentally or militarily, from this world’s sources of power and the abuses of industry.